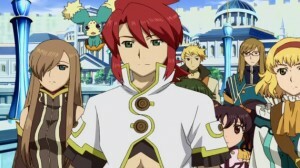 Tales of the Abyss is a Japanese Role-Playing game with an action-based combat system. As you go through the story, you will explore towns, complete sidequests, meet new characters, explore dungeons, find treasure, fight monsters, fight bosses, complete puzzles, everything that you would expect to find in an RPG. 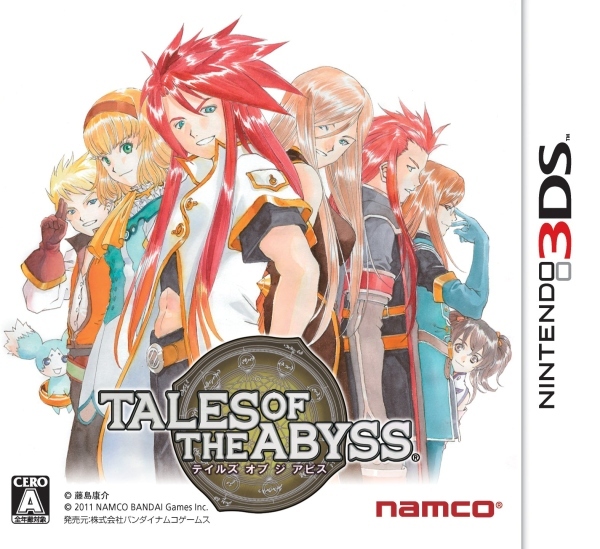 What sets Tales of the Abyss apart from other JRPGs is its unique combat system (although this is present in one form or another in other “Tales of” games) ; the player controls a single party member in battle and can move left and right on a 2D plane, attack by pressing a button and pull off special abilities known as “Artes” by holding a direction on the circle pad and pressing the “Artes” button. However, movement is not limited to this 2D plane ; you can hold down the shoulder button and move around in 3D if you wish to get away from enemy attacks. Battles are initiated by coming into contact with the enemy models that are moving around on the field or in dungeons, there are no random battles. However ; if an enemy manages to come into contact with you from behind while exploring, then you will start the battle with a different party formation (characters not in your party will be in battle and vice versa). 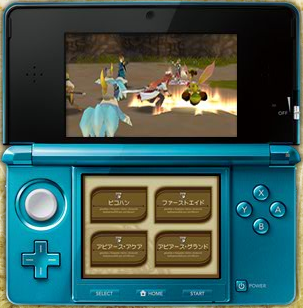 During battle, you can switch characters on the fly as well change the general strategy and formation of your fellow party members to adapt to situations, should you use items in battle, there will be a short cool down time in between to prevent excess item usage and potentially make every battle too easy. The battles in Tales of the Abyss are quick and fun to do, and at no point in the game did a battle feel like a chore. The battle system is definitely something to praise the game for. Tales of the Abyss allows you to cook food you have found recipe for. The process works like this : you buy ingredients from the store, you assign an ingredient to a character, after every battle, you can choose to cook that food with that character if you have the ingredients and should they succeed, you will gain benefits such as recovering HP or having temporary stat boosts. Different characters have different cooking abilities and having a character cook a certain food enough time will eventually lead to them mastering that recipe and lessen their chance of messing it up. An interesting feature in the game is the Grade system, which are present in all modern “Tales of” games. Upon completing each battle, you are awarded Grade points depending on how well you performed in battle (you get deducted Grade should you take longer to complete a battle or lose more HP than you should have). Grade points do not come into play until upon completing the game and starting a new game. You have the option to spend Grade points in the Grade shop and purchase various game enhancements, such as inheriting items from your previous playthrough, experience point multipliers, unlockable difficulties and many more. It is certainly a neat little feature to include in an RPG which really encourages multiple playthroughs, not to mention the chance to access some unlockable character costumes that cannot be acquired in the first playthrough. During exploration, you have the option to listen in on conversations between the characters. These are known as “skits” and are triggered after story events or certain milestones. Most of them are just for humor value to be honest, but some reveal little bit more about the characters. Unfortunately in the western release of the game, voice-acting has been omitted from the skits, so all you’ll be seeing are the lips of the characters moving and subtitles appearing at the bottom of the screen. For me, although it didn’t take away from the experience I feel it would have been nice if the developers had taken the time to include the voice-acting. As you play through the game or complete sidequests, you will receive “titles” for each character which you can assign to them on their status screen. These titles offer hidden effects in battle, such as HP regeneration, although some of them are actually costumes and will completely change the character’s appearance. The costumes show up everywhere as long as you have them equipped, most of them are quite stylish while some are just humorous. Mixing things up : our reviewer was impressed with Tales of the Abyss’ battle system. 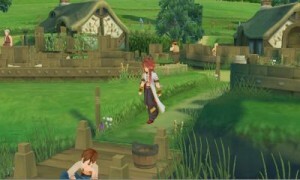 Unique to Tales of the Abyss is the economy system (although this may not be immediately obvious). As the game progresses and the armies fight different wars in the story, prices within different towns and cities change depending on what is going on within the plot at that moment. For example, while there’s a war happening within the plot, the prices of all items, weapons and armor are increased, only to be returned to their original state after the war is ended. Another example of changing prices is when you complete sidequests within certain towns, which can result in the prices of items in that town being slightly reduced. This is a very interesting method of showing you how the game world changes around you and giving you the feeling of how things may or may not remain the same, encouraging you to check back on previous locations to make the most of your time. A lot of gaming shortcuts are apparent in Tales of the Abyss, while exploring, you can instantly bring up the map, highlight a town and check shop prices from there, without you having to waste your time looking up a guide or revisiting locations to check if items are at cheap prices. Amazing. One final thing I should mention that is also unique to this game are the capacity cores which you can equip on characters. These affect stat growth when they level up, and should certain stats reach a certain point, they will learn different “AD Skills”. AD Skills are passive abilities that can help immensely in battles, they can be turned on or off in the status menu, but there is never a reason to have them off unless you wish to give yourself a challenge. In conclusion, Tales of the Abyss is a wonderful JRPG with a fantastic and emotional plot, immersive gameplay, funny and witty characters and dialogue, and gameplay mechanics which cut out most if not all the boring and unnecessary features most JRPGs provide. If I had to nitpick I would point out that the pacing of the game can feel rather off at times, some sidequests require an insane amount of backtracking and travelling as well as permanent missables and absurd requirements for certain sidequests, (although, mercifully, you don’t HAVE to complete them), the lack of voice-acting during skits and the fact the 3D doesn’t look that impressive either. 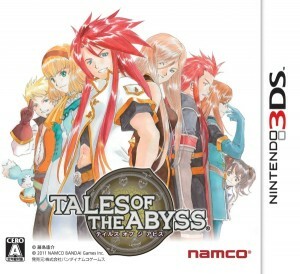 But overall I’d say Tales of the Abyss is definitely worth £40. Especially as you will be getting over 70 hours of enjoyment.